Indeed, the simplicity and versatility of Python has made it the preferred language for a lot of programmers, particularly in a professional setting. In fact, last year, it held the #2 most popular programming language (as rated by github pull requests), a position it has maintained for at least the last 4 years. How did Python first come to be, and how was it able to rise to the top of the pack like that? Let’s take a look at the rise of Python. Python was first developed in the late 1980s and officially launched in 1989. Developer Guido Van Rossum had previously worked with the ABC programming language, which he liked in many ways, but also had problems. Furthermore, he found ABC couldn’t be extended to address those problems. That lack of extendibility is what ultimately prompted Van Rossum to create his own programming language, which implemented the features of ABC that he liked, resolved the issues that he had, and had better extendibility overall. While he labored on this new programming language, Van Rossum also found himself reading scripts from Monty Python’s Flying Circus, which inspired the name Python. October of 2000 saw the release of Python 2.0, which had a more transparent, community-centered development process, and included support for Unicode. Then in 2008 came Python 3.0, which made a number of changes which will eventually render previous versions obsolete. Support for Python 2.7 is currently set to end in 2020. Many speculated at the time that this lack of compatibility between versions would spell the end for the programming language. But that obviously hasn’t been the case, and Python’s popularity has continued to grow. So, what is it that people love about Python? Obviously, its versatility and ease of use are major contributing factors. Whereas other languages require learning a lot of complex commands, Python follows a more natural syntax that’s more in line with ordinary language. This allows you to write code more quickly, with fewer errors. But that’s hardly the only reason for Python’s popularity. Not only do the easy commands make for faster coding, there’s also a great selection of libraries to help in coding projects so that you don’t have to build code from scratch. It also uses cloud computing, which makes for convenient storage and easy access to your project from any device. And it’s compatible with just about any coding environment, with almost no performance loss between platforms. Perhaps most importantly, though, when it comes to Python’s rapid growth and rising popularity, is this: it’s the programming language of choice for Google. It’s what they use to write their numerous platforms and applications. They even offer a developer portal for it, along with free classes, tutorials, and other educational materials to learn the language. First of all, this kind of backing is a great way of getting noticed. But it also means that any programmers/software developers hoping to work for Google at some point—which, let’s face it, is almost all of them—have to learn Python in order to be able to function in that environment. 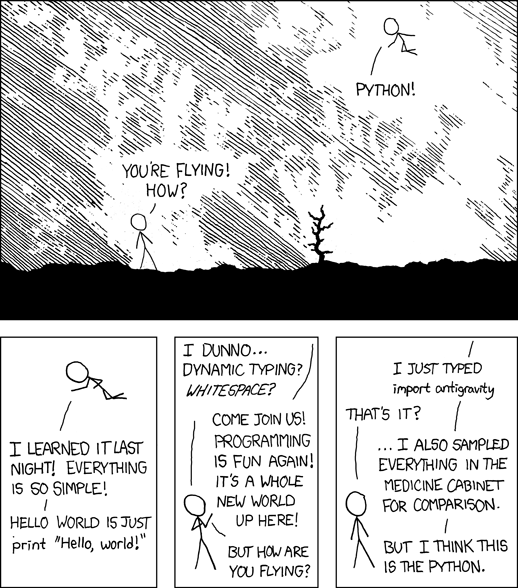 That, plus its easy learning curve, are probably the two biggest reasons why Python is now the #1 programming language. Despite the critics’ pessimistic view of Python 3, many believe that even at #1, Python still hasn’t hit its peak. From its initial conception, it was designed to have virtually limitless potential, particularly as Guido Van Rossum ensured that it would have extendibility. Where will it go from here? It’s difficult to say. But one thing’s for sure: learning Python is and will continue to be incredibly important in today’s programming world. How will you use Python to meet your programming needs?